When you’re in the pet store, do you often wonder whether you should be getting your cat dry food or wet food? That’s a very common question for cat owners! To help you with the decision process, let’s look at Cat Food – Wet vs Dry! Unless your cat is unnaturally fond of water, it’s quite likely that they’re not getting as much water in their diet as they need. Dry food doesn’t help with this as it has very low moisture content. But in contrast, wet cat food is full of moisture, making it an easy way to keep your cat hydrated! Likely when you first started considering wet vs. dry cat food, you didn’t consider your cat’s teeth! But there are actually some dental pros and cons that come with each type. Wet cat food is soft, meaning it just gets mushed up in your cat’s mouth when they chew it. The soft food doesn’t really benefit their teeth in any way, and may actually get left behind on teeth, speeding up dental decay. In contrast, dry cat food scrapes your cat’s teeth while it’s chewed. This helps to clean their teeth. That, plus the fact that it’s more difficult for dry food to get stuck on teeth, makes dry food better for your cat’s dental health. Another point to consider when comparing wet and dry cat food is the convenience of storing and serving each kind. It’s much easier to find space for a bag of cat food than it can be to find space for a whole 24-pack of cans. It’s also easier to scoop out your cat’s dry food meal every day, while cans require a few more minutes of your time. And if you should ever have to travel with your cat or board your cat somewhere, it’d be much easier to carry around a baggie of dry food than to have to haul enough cans for however many days your cat will be away from home. A major consideration when looking at wet vs. dry cat food is the price. When you consider how long a bag of dry cat food can last vs. wet cat food of equal cost, the dry food will likely be a more budget-friendly option. However, you have to remember that you get what you pay for. Is saving more money on cat food now going to cost you more later when your cat has to go to the vet for a dehydration related issue? Of course, it doesn’t really matter that much how you feel about wet vs. dry cat food if you can’t get your cat to eat one of the types! Many cats by default seem to like wet food more, making it easier to feed a finicky cat. With dry food, you may have to go through a lot of different brands and flavors before you find one your cat tolerates. In the end, the best solution is likely to either go with a full wet food diet, or a half wet, half dry diet (which is a budget-friendly compromise). But you should consult your veterinarian before making a final decision. They can help you choose the very best type of food for your cat’s individual needs! Does your cat like wet or dry food, or both? My mom’s cat prefers dry food, but my mom thinks that wet food is healthier for her cat. So she gets wet food for her meals and dry food as a treat. Hey, there ya go! Perfect balance! My cats love wet food! They pork out. I wish I could feed my cats wet chow all the time but I have three and it’s just not an option due to the cost. I do like to get it whenever I can though, I prefer the really good stuff like the Blue Wilderness brand or something like that, but the dollar store often has fantastic sales on 8 Lives and Meow Mix wet food so I take what I can get. Anything is better than their sad, corn based kibble. I don’t think that should even be a thing, cats don’t eat corn! I agree on the better foods! And you are right! Who needs corn in cat food?! My cats won’t touch wet cat food. I’ve tried several brands and flavors. Our kitty gets both wet and dry cat food all day long. He actually eats more dry food over the wet food and he drinks plenty of water throughout the day. Thank you for posting this. It -can- be confusing, especially when we’re taking in so much information about food– from all kinds of sources! When I had a cat he wouldn’t eat canned food. Only dry. I thought that was odd. Thanks for a most helpful article. They love it and it’s good for all of the reasons you listed. My cat slightly prefer wet food, which she only gets on special occasions. 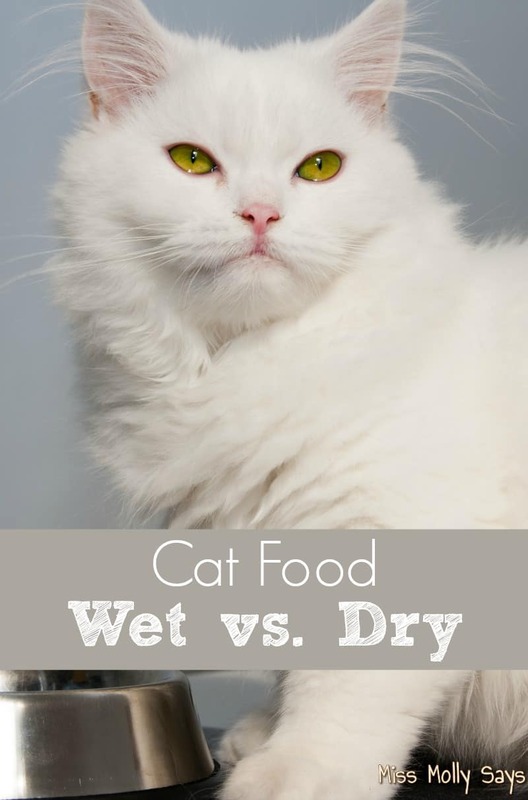 I was always confused about giving my cat Cat Food – Wet vs Dry. I heard all different things regarding this, so it is good to read more info about it. Very informative! Sounds like a combo of wet and dry food is the way to go. I am doing a combination for my cat but many of my friends have their cats on a totally wet food diet. My cat gets high quality dry food with raw components.